Delicious, healthy and full of fruity flavour, Onken Wholegrain Fat Free Apricot has no artificial flavourings, colours or preservatives and is suitable for vegetarians. Pure, nutritious and delicious for any time of the day – perfect breakfast ingredient, super-healthy mid-morning drink. Simply the tastiest way to support your vitality and wellbeing – live Bio-tifully! A spoonful of Hartley’s adds to delicious touch of fruity sweetness to any breakfast. A must-have for any family fridge. A delicious & nutritious blend of 12 different fruits with the great taste you’d expect from Tropicana. Drinking oats turn any cold drink into a smooth snack. It’s just made of oats, so there’s nothing artificial and no added sugar; you won’t get an energy rush then crash. Follow this link and add the 5 products to your trolley. Place an order worth £40 or more, for delivery before 18th March. Add the voucher code VOU6686618 as you check out (cannot be used with any other voucher). This entry was posted in Freebies and tagged Freebies by Ocado. Bookmark the permalink. 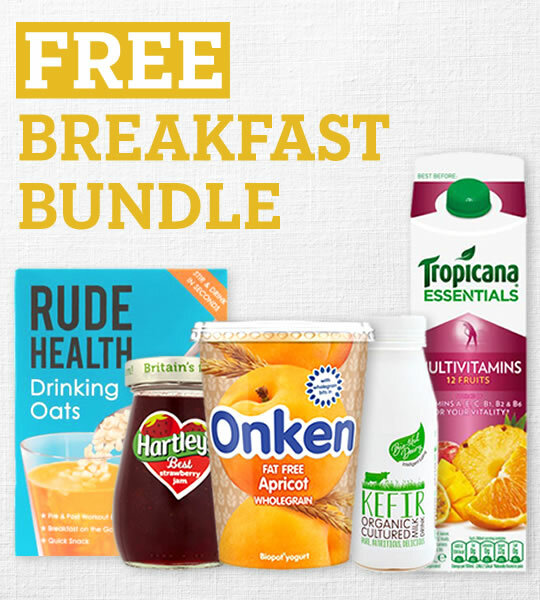 Hope I’m in with a shout for breakfast bundle! Fingers crossed for you Elizabeth. Our pleasure, enjoy your breakfast. How soon do you find out if you have got the bundle as it didn’t say at checkout? Hi Annie, if you added all of the products to your trolley, and then applied the voucher code, you should have noticed the value of the products come off your total. Hope this helps. I order from you 3 times a week and have a delivery pass. I never received info about this offer & I’m a good customer.